16-18-4. That is the record the 2017-2018 Quinnipiac men’s ice hockey team finished with. But after a grueling off-season, combined with the bringing in of many new faces to the program, that season is long forgotten. 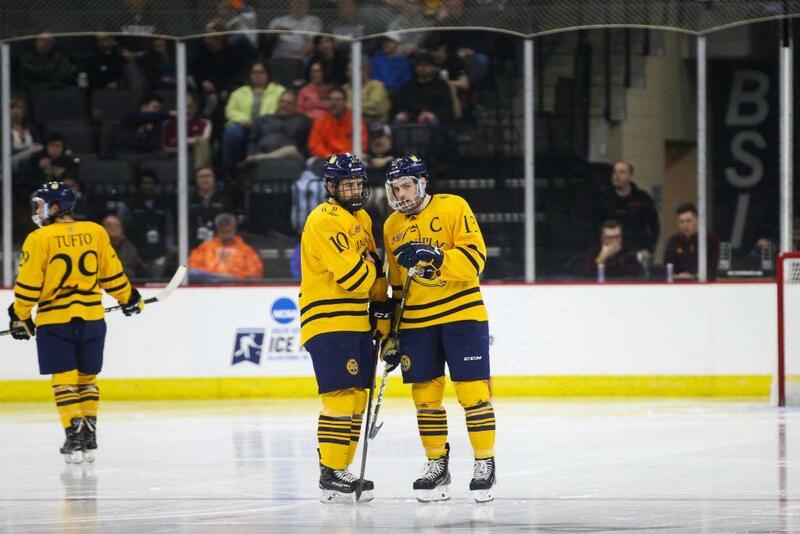 Flash forward to the the 2018-19 season, one that was certainly a magical one for the Quinnipiac men’s ice hockey team (26-10-2, 14-6-2 in ECAC Hockey). However, it came to an abrupt end on the last day of March, as they were defeated at the hands of Minnesota-Duluth (27-11-2, 14-9-1 in NCHC) by a score of 3-1 in the Midwest Region finals. This was the first ever contest between these two prosperous programs, and the first period indicated that. Both teams seemed to be feeling each other out, with a level of unfamiliarity being displayed. Neither team generated too many grade-A scoring chances, but that would all change in the second period. Minnesota-Duluth came out with a relentless offensive zone cycle and forecheck, pinning the Bobcats in their own zone for most of the period. The Bulldogs were rewarded when Scott Perunovich, a St. Louis Blues draft pick, fed Peter Krieger to pull ahead with just under five minutes remaining in the middle frame. Even with a dominant second period, the Bulldogs were only able to get one goal on the board. In the third period, the Bobcats came out of the gates with plenty of energy and determination, but could not tie the game up. Playing this aggressive and offensive style created a defensive breakdown late in the third, when a Minnesota-Duluth forward finished off an odd man rush opportunity with 5:02 remaining in the game, increasing their lead to 2-0. Yet, the Bobcats kept on coming. Soon after Minnesota-Duluth’s second goal, Quinnipiac senior forward Craig found a way to get his team on the board, ripping a shot top shelf past Bulldog goaltender Hunter Shepard. This goal incentivized Quinnipiac to pull net minder Andrew Shortridge for the extra attacker, but the attempt to tie the game came up short, as Minnesota-Duluth sealed the game with an empty net goal by Parker Mackay. The Bulldogs punched their ticket to the Frozen Four for the third consecutive year. Quinnipiac’s season may have come to an end sooner than they would have liked, but there can only one team in the nation that is able to win its final game of their season. Being one of the final eight teams standing was a major bounce back for the program, who finished the 2017-2018 season with a losing record. The future does look bright for the Bobcats. A very young team, they will only get better with experience. Stay tuned for next year, as you very well may see Quinnipiac back in the NCAA tournament – only this time, they’ll be looking for a different result.